Lurking in every Legal Department budget is a giant uncertainty: the outside counsel spend. According to Altman Weil’s Chief Legal Officer Survey, law firms account for 49.3 percent of legal budgets – the single largest category. As consumers of legal services know, when the outside counsel spend is governed by hourly billing, it’s inherently hard to predict, as it can vary with the phase of a project, the demands of the other side, even the habits and styles of the lawyers involved. Much has been written about the philosophies behind alternative fee arrangements and efforts to align law firms and their clients on value; we don’t need to repeat it here. Instead, because it’s budget season, we’ll look at the most popular (and budget-friendly) fee structure and how you can implement it for greater success in 2019. 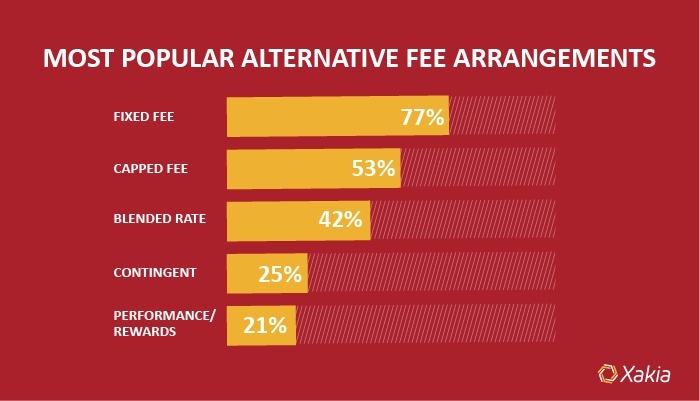 What is the most common alternative fee arrangement? Norton Rose Fulbright’s data shows that in addition to being the most commonly used alternative fee, the fixed fee is growing in popularity; from 2016 to 2017, respondents ranking it among their top three rate structures grew by nearly 15 percent. The advantages? The fees are not based on time, and because both client and firm know what the total spend will be, the client avoids billing surprises, and the firm has an incentive to improve staffing decisions, processes, workflow and technology. AdvanceLaw, a consortium of general counsel who share performance data to select outside counsel, said 49 percent of in-house counsel said they feared quality would suffer under flat fees. Fortunately, AdvanceLaw data shows that’s not the case. Flat fees “consistently delivered better cost-effectiveness than hourly rates.” On average, only one of 100 flat-fee matters performed poorly on cost-effectiveness, compared with one in 20 for hourly rates. Service quality was the same under flat fees (but clients are happier with the bills). The legal areas for which Legal Departments are most likely to use flat fees are intellectual property, employment and M&A. AdvanceLaw’s summary for American Lawyer is available here. Fixed fees: What are the options? Fixed Fee per Deliverable, such as a licensing agreement or deposition. Fixed Fee per Matter, such as a commercial real estate transaction or single-plaintiff employment trial. Flat Fee per Period, such as a month or quarter. Portfolio Fixed Fee, which assigns a large portfolio of work to a single firm for a set period (for example, all employment litigation for a fee of X). The criteria for success for all four: The work needs to be defined, recurring and predictable. So we know that fixed fees will help you hit your budget and achieve better results, and we know that fixed fees are best for work that is ongoing and easy to forecast. How do you get started? Legal Department Intelligence. Remember that we’re looking for matters that are defined, recurring and predictable. For now, let’s ignore the right side of the chart, which shows matters of high strategic value. For these projects, you may want to preserve immediacy and flexibility (and be willing to pay for it). 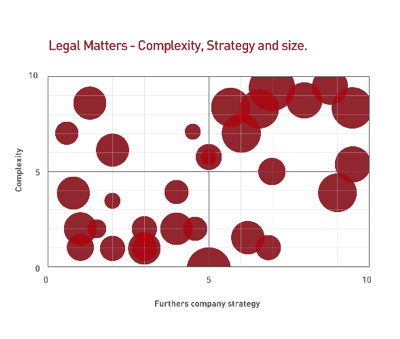 Complex + Low Strategic Value: In the upper left quadrant, matters are legally complex, although they don’t have much bearing on the company’s strategic plan. Consider engaging a boutique specialist on a flat fee per period or portfolio fixed fee; either way, this “brain drain” work is covered, and you have absolute budget predictability. Simple + Low Strategic Value: In the lower left quadrant, matters are both straightforward and unstrategic. For fixed fees, this is a target-rich environment: Outline fixed fees per matter or deliverable, then review two years’ worth of data to find average volume – instant budget Zen. With data in hand, you can start a meaningful conversation with your law firms; after all, it will be easier for them to create accurate fixed fee proposals when you supply reliable information on scope and work volume. It’s a discussion that most, if not all, of your firms should be more than willing to have: In Altman Weil’s Law Firms in Transition survey, 85 percent of managing partners said their firms were pursuing proactive conversations about pricing and budgets. Taking the time to establish smart fixed fees now will set up your Legal Department for success in 2019 and beyond. Indeed, according to Altman Weil’s CLO data, 70.5 percent of teams that implemented alternative or fixed fee arrangements report a significant improvement in cost control; 74.7 percent report a significant improvement in outside counsel performance.